Planners are committed to looking at how future technology can influence and shape the fabric of our communities. Planning professionals are uniquely able to address the impacts of today's actions on tomorrow's communities in a comprehensive way and over the long term. AVs are poised to disrupt the built environment and planning practices just as the automobile did more than a century ago. Planning for Autonomous Mobility is a call to action for planners to develop policy solutions and infrastructure investments that ensure an attractive, people-friendly, equitable, and safe AV future. PAS reports are available free to APA members. Preparing Communities for Autonomous Vehicles resulted in part from the AV Symposium on October 6, 2017. APA and partners convened 85 national AV and connected vehicle experts for this event as part of its Autonomous Vehicles: Planning for Impacts on Cities and Regions research. Discussion topics included accessibility, equity, transportation planning, and built environment impacts. APA partners included the National League of Cities, Mobility E3, George Mason University, Mobility Lab, Eno Center for Transportation, and the Brookings Institution. Preparing Communities for Autonomous Vehicles is the product of in-depth research and collaboration between APA and various partners. It provides land use, transportation planning, and economic guidelines for addressing AVs. AVs will have significant impacts on policies, legislation, and regulations at the national, state, and local levels. APA's policy principles outline key areas of focus for planners and advocates to help shape federal programs and policies related to autonomous vehicles. Planners Advocacy Network members have exclusive access to a webinar on the implications of proposed federal legislation. The Planners Advocacy Network is free to join for APA members. Looking for examples of how other communities have approached or responded to AVs? The AV KnowledgeBase provides a cumulative resource of best practices from reports, briefing papers, articles, policy guides, planning documents and videos from around the country. A grant from the Federal Highway Administration (FHWA) has made this collection open to the public. "Planning the Autonomous Future" is a new podcast series from APA. The series explores the many ways in which autonomous vehicle technology will impact cities and regions, mobility, and the planning profession. In the first episode of the series, host Jennifer Henaghan, AICP — APA's deputy research director and Green Communities Center manager — and cohost Kelley Coyner — CEO of Mobility e3, a transportation leadership firm that helps communities plan, pilot, and deploy AV fleets — provide an introduction to AVs and explain why every community needs to be paying attention to them. In this episode, Jennifer and Kelley hear about the ins and outs of conducting autonomous vehicle pilot projects from Corey Clothier, AV technology development and deployment strategist at Mobility e3. Later on in the episode, the three talk autonomous vehicle design and what types of eye-catching looks vehicle makers are coming up with. Jennifer and Kelley take stock of multiple autonomous-vehicle-focused sessions from the 2018 National Shared Mobility Summit, which took place March 12–14 in Chicago. Later on in the episode, they welcome Jeff Tumlin, principal and director of strategy at Nelson\Nygaard, to the table. Jeff moderated the summit plenary session called "The (Shared) Road Ahead: An Electrified, Connected, Autonomous, and Accessible Vision of Transit," and he discussed the topic with Jennifer and Kelley, touching on what could happen if autonomous vehicles aren't shared, why we need to prioritize space-efficient modes of transportation for AVs to work, and why planners need to take sprawl seriously when planning for automated vehicles. "Transportation Q&A — Disruption: AV and Tiny Cars" is an audio interview conducted by APA Editor in Chief Meghan Stromberg with Josh Westerhold, senior manager of Nissan's Future Lab. Planning magazine, April 2017. 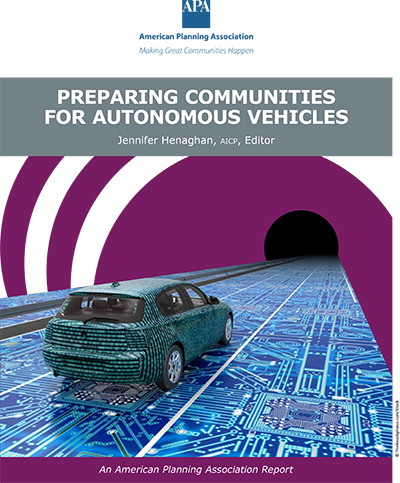 The December 2017 issue of Zoning Practice, Getting Ready for Driverless Cars, explores the categories of AVs and how communities need to plan for accommodating both automated and non-automated vehicles. Available free to ZP subscribers or for single-issue purchase. Autonomous Vehicles: States Pave the Way (February 2018) blog post looks at how autonomous vehicles are being addressed at the state level. Congress on Road to AV Legislative Vote (September 2017) blog post addresses at the status of federal legislation on autonomous vehicles. Driverless Cars, Planning and Architecture (August 2017) blog post recaps a panel discussion about the impact of AVs on future mobility and development within the Chicago region. The discussion was held at APA's Chicago office. "Here Come the Robot Cars" from Planning's April 2017 issue spotlights how AVs will impact the built environment and what to do now. Michigan Joins Small Number of States with Self-Driving Car Laws (January 2017) blog post reports on the progress of AVs and AV legislation in the home state of American automakers. The Commissioner addressed "Driverless Vehicle Best Practices" in the December 2016 issue. Available to APA members and subscribers. Planning for the Autonomous Vehicle Revolution (June 2016) blog post looks at why planners need to be part of the AV conversation. Automated Vehicles and the Next Great Transformation of the Built Environment (June 2016) blog post highlights the research work on the impacts of AVs from the Florida State University Department of Urban & Regional Planning. Autonomous Vehicles Zoom into Public Imagination in 2016 blog post looks at how AVs became one of the hot topics of 2016. 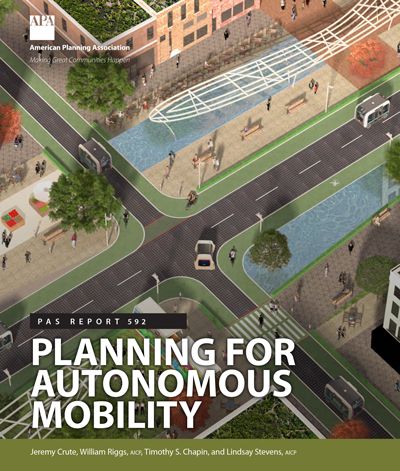 "When Autonomous Cars Take to the Road" from Planning's May 2015 issue explores how AVs are coming quickly to roads near you. "Attention: The Age of Automation Is Right Ahead," an exclusive web-only article in the Planning May 2015 issue, examines what self-driving cars will mean to drivers. Get up to speed on best practices with online courses for individual study. These on-demand courses on autonomous vehicles are available for purchase through APA's Knowledge Center.